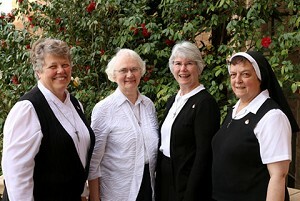 BEAVERTON — The Sisters of St. Mary of Oregon have elected their 2015-2020 leadership team. The election came during their every-five-year general chapter meeting, held at the SSMO Motherhouse. Sister Charlene Herinckx was elected to a second term as Superior General. Sisters Juliana Monti, Josephine Pelster and Rita Watkins will also serve on the leadership team. Chapters give time for spiritual introspection and charting a course for the next five years. Sister Charlene opened the chapter with 61 Sisters in attendance. Sister Charlene holds master’s degrees in education and private school administration. A teacher and principal at schools across the Portland metro region, she has served on the National Religious Vocation Conference Board. Sister Josephine served as a registered nurse at Maryville for 25 years. A board-certified chaplain, she served in many medical settings in the Northwest before returning to Maryville in 2008 as director of pastoral care. Sister Rita Watkins has spent more than 50 years in ministry as a teacher, principal and president of the Sisters of St. Mary of Oregon campus schools. She has served as superior of the motherhouse and coordinator of ministries.